Matt Miller drove to his third UMP Late Model win this season at Oakshade Raceway in Saturday night’s 40-lap Barney Oldfield feature event to earn himself a check for $4,800. Brian Ruhlman grabbed the early lead over pole-sitter Jim Scout after starting on the outside of the front row. Last week’s feature winner, Dona Marcoullier, brought out the first caution when he spun in turn two on the second lap. Matt Miller was second on the restart and began to pressure Ruhlman for the lead. Miller went to the outside of Ruhlman and the two drivers raced side by side for several laps until Miller took over for good on lap 12. Miller proceeded to open up his lead through a long green flag run while lapping a good number of cars at the back of the pack. The only other caution flag came out on lap 33 for Chris Ross who had problems in turn two. That allowed Ruhlman to restart alongside Miller, but Ruhlman couldn’t stay with the Rick Delong Racing number three. Miller went on to pick up the easy victory with Ruhlman finishing in second. Curtis Roberts was third followed by Dan Wallace and an amazing run by Jeff Babcock to end up fifth after starting in the 20th position. Bob Gregory padded his Oakshade UMP Sportsman point lead with his third feature win of the year. The race ran flag to flag with no cautions allowing Gregory to open up his advantage over last week’s feature winner, Bruce Stuart, for much of the race. Mike Jessen got by Stuart late to finish second. Stuart slipped back to a third place finish followed by Matt Lindsey and Joe Derbeck. The 24-car UMP Bomber A Main made up for the lack of yellow flags in the Sportsman feature with multiple cautions that kept the field tight. A caution for Josh Sisty who was running in the top five allowed Terry Rushlow to restart alongside race leader Jeff Foks. Rushlow challenged Foks for the lead, but after a few laps, Foks was able to pull away and picked up his sixth feature win of the year. Amy Bernard had another great run to finish third behind Rushlow after starting 13th. Chris Sands and Jeff Geis were the rest of the top five finishers. Taylor Dippman held the early lead in the Hornet feature after Brandon Myers and “Sparky Marky” Gillingham got together at the start. Both drivers were able to continue on without a caution, but lost a lot of ground on the rest of the competitors. Dippman tried to fend off Drew Smith, but Smith got by late in the race to earn his third feature win of the year and reclaimed the point lead by just four over Gillingham. Dippman finished second in the race with William Cundick in third. “Sparky Marky” Gillingham recovered to finish fourth followed by Devon Bell in fifth. Derek Morris was trying for his sixth UMP Sport Compact feature win of the year as he challenged leader Trent Delong early in the race, but Morris wouldn’t finish. Morris fell off the pace and retired to the pits leaving Delong to pick up his first feature win. Regan Ford finished a distant second followed by Stephanie Miller. Dave “Gumby” Golembiewski Jr. earned his second UMP Bomber B Main win of the year. Charles Stuckey had a strong top five run cut short when he spun down the front stretch on lap nine. Karl Spoores restarted behind Golembiewski, but was unable to get by on the final three laps. 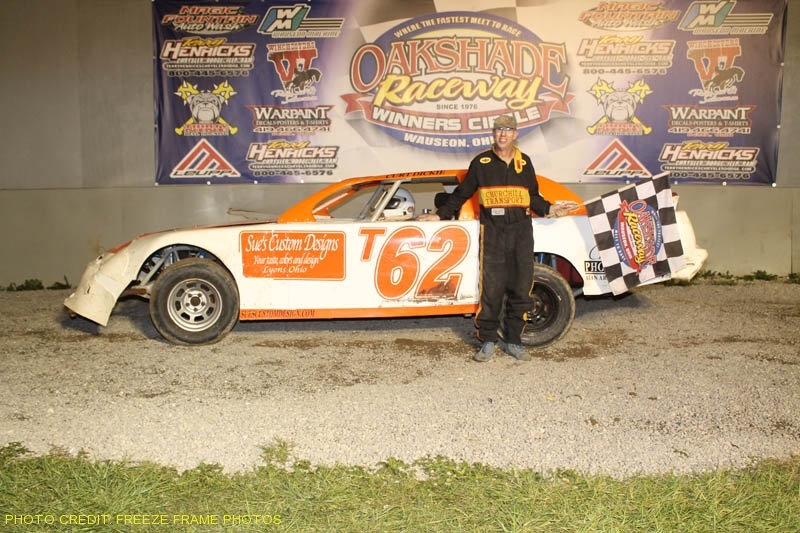 Spoores settled for second followed by Brandon Clark, Joe Heffner and Gary Cole Jr.
Next Saturday, June 30, is the Night of Wheels at Oakshade Raceway. Donated bicycles of all shapes and sizes will be given away to a bunch of lucky kids at intermission. Also, in addition to a full show of UMP Late Models, UMP Sportsmen, UMP Bombers, Hornets and UMP Sport Compacts, the Vintage American Race Cars will be on hand. Gates open at 4pm with racing at 7pm.